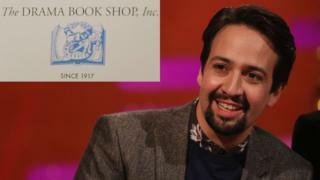 Lin-Manuel Miranda and three of his Hamilton collaborators have taken over a theatre book shop in New York. The Drama Book Shop is having to vacate its current location in Manhattan due to rent increases. Miranda, Thomas Kail, producer Jeffrey Seller and theatre owner James L Nederlander are helping with the shop's rescue plan. This includes finding a new location for the store, recognised with a Tony honour for excellence in 2011. The four men purchased the store and its 155,000 items from Rozanne Seelen, who had managed the shop with her late husband since 1969. Miranda has enjoyed huge success in the world of theatre and film, having created the Broadway musicals Hamilton and In the Heights. He co-wrote songs for the Disney film Moana soundtrack and can currently be seen as Jack the lamplighter in Mary Poppins Returns. Writing on Twitter, Miranda said he had spent a lot of time in the shop with Kail, the director of Hamilton. "As a teen, I went to the Drama Book Shop," he remembered. "Spent hours reading plays. Felt made for me, a place to go. "In 2002, I met with Tommy Kail in the Drama Book Shop. It gave us a place to go. "Proud to be part of this next chapter, a place for you to go." He also shared a photo taken of him and Broadway actor Christopher Jackson outside the store in 2002. The family-run store has been in existence since 1917 and has moved several times. Its current home, until 20 January, is 250 West 40th Street, opposite the offices of the New York Times. Home to more than 8,000 play manuscripts, it is used by theatre professionals and students in the city. The store's latest relocation is expected to take place this autumn.